Mike, Don and Raph are on the rooftops overlooking some buildings. Don uses a payphone to contact Karai and is given a rendezvous point. Raph wonders if it’s a trap, but Mike thinks that they can trust Karai. “What choice do we have?” he muses. 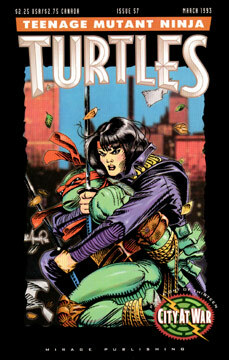 Leonardo is bound at the feet of Karai and a cadre of Foot Soldiers in an abandoned warehouse. Karai orders her henchmen away and she cuts Leo’s ropes, freeing him. Just then the other three Turtles arrive. Karai explains that she is the leader of the Foot in Japan and that she’s come to New York to restore order. Ever since Leo killed the Shredder (TMNT #21), the Foot faction in NYC has been in chaos, with different groups warring with one another for ultimate control… save for Shredder’s Elite, who have been carrying out seemingly motiveless attacks on the other factions. Karai offers the TMNT a deal, if the Turtles kill the Elite and remove this unpredictable thorn from her side, she will offer them a truce with the Foot Clan. Raph is angry and unwilling to partner with Karai, but she tells them to think about it and leaves. By now, Gabby is quite pregnant. Casey is working in the diner with her and the two are thinking about moving out of their trailer and renting a house, since the baby will arrive soon and they’ll need more space. April and Robyn attend their father’s funeral. April tells Robyn that she’s moving back to New York, as it’s time for her to stop running from her problems and deal with them. Splinter wakes from the dream, screaming himself. He quickly grabs a nearby rat and eats it. Meanwhile, we see a Foot Soldier near the destroyed water tower the Turtles had been living in. He is ambushed and killed by two Elite. The pair then kick down the door of the room that was being used to spy on the Turtles and kill the remaining Foot Soldier. The old man is in the hospital, getting physical therapy on his leg. The Elite examine some photos of the TMNT, and realize that they’ve arrived too late. The leader crumples the picture and the deadly duo depart.